Scaling your handheld props correctly can be a huge pain. Many times, there’s no context in your reference images to help you realize how big or small that prop should be. I run into this problem all the time when designing and re-making space guns from video games, so I’ve come up with a fool proof way to scale prop guns. 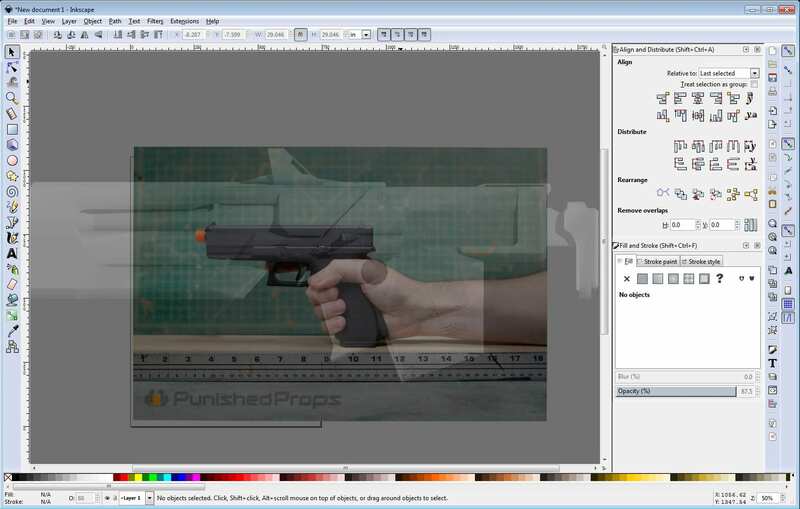 First, you’ll need a real gun, your hand, and a ruler to take a reference image. Don’t have a real gun? An appropriately sized airsoft gun should do the trick! Don’t have one of those? I’ve got you covered. 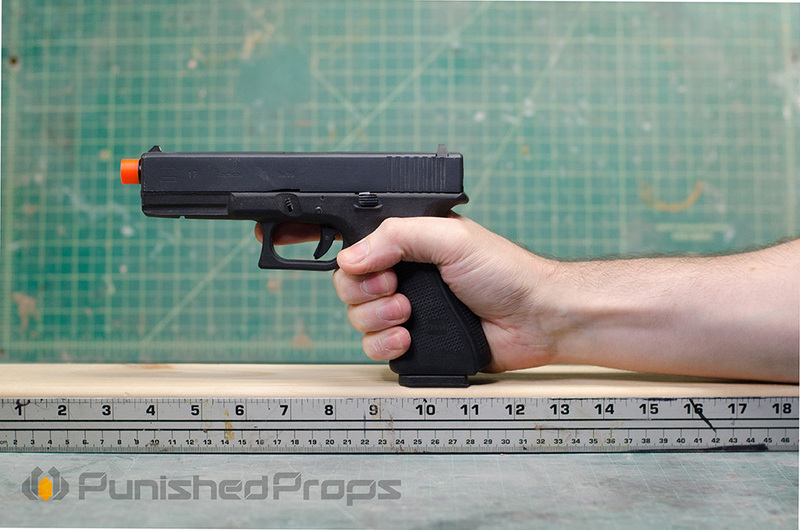 You can download these shots of my hand along with an airsoft Glock to use for your project. I have an average sized hand, so it should work for most people! Download the full resolution image linked above. This image can be dropped into your image editing software of choice. I like to use Inkscape. I uniformly scale the image to be about 18″ wide in the drawing area. This way, I know any measurements I make in Inkscape will be scaled to this pistol’s real world dimensions. I’ll then drop in a side view reference image of the prop I will be using and drop it’s opacity to 75%. This way I can see the reference gun and hand through the prop gun. Then I can re-scale this top image so that the video game gun handle fits my hand. Re-scaling the video game reference to my hand. 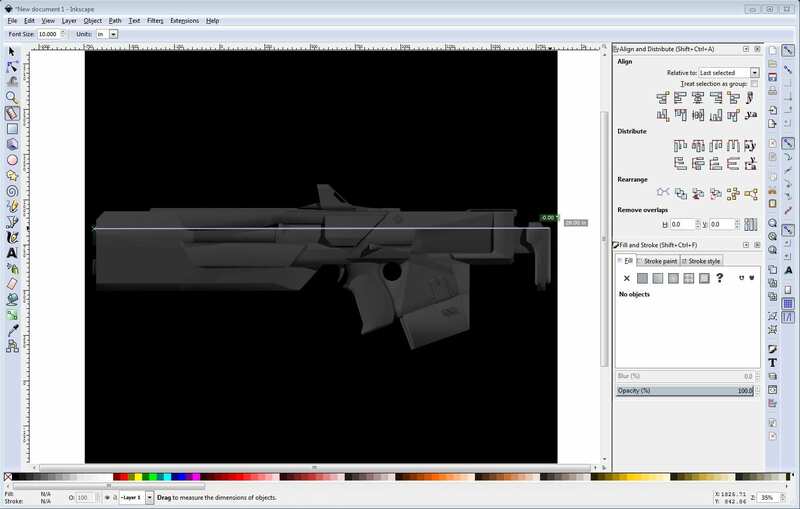 Once I can be sure the video game gun is accurately scaled to my hand, I can use the measurement tool in Inkscape to figure out the dimensions of the gun. I’ll usually take a general measurement, like the length, and see how that stacks up by holding a yardstick like a gun. You can also make a quick mock-up handle with the measurements from your images to see how it fits in your hand. 28″ seems like a good length for a scout rifle. The same techniques can be applied to the top view to make sure your gun is the correct thickness. Now you’re armed with everything you need to know to scale your space guns appropriately to your own proportions! Feel free to download my Glock reference images or go out there and make your own! This would be just as easy to do with a sword or dagger prop. Be safe and happy prop making!